Much has been made of the denial of Vereniki Goneva’s try for Newcastle against Sarries at the weekend for a “game value offence” (whatever the hell that is). 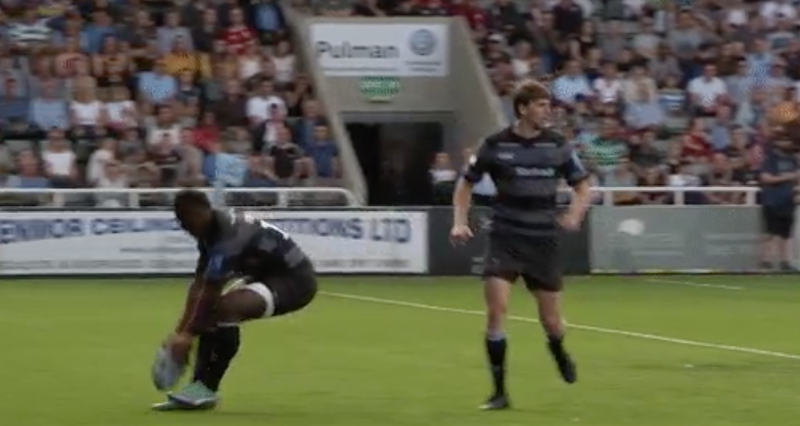 To recap, Goneva fielded a missed drop goal attempt behind his own line and feinted to touch down, touching the ball against his boot before running the length of the field to score. Unfortunately for the Falcons, however, referee Ian Tempest had already blown up for a 22-metre drop out and the try was not given (and, in any event, the Saracens players had stopped when the whistle was blown). So that – really – should have been that. In my view the referee clearly thought the ball had been touched down and erroneously blew his whistle. Mistakes happen, get over it. Except in this instance Tempest, rather than admit his mistake, chose to shoot himself in the foot by saying that he had seen the non-grounding of the ball but decided that Goneva’s subterfuge amounted to a “game value offence”. Which – clearly – is nonsense as Tempest should, if that were the case, have penalised the Fijiian rather than award the 22 metre drop out. My view on this is quite simple. Goneva’s innovative and creative trickery is to be applauded and encouraged. In attempting to label it an offence in order to cover up a (perfectly understandable) refereeing error, Ian Tempest is simply being disingenuous. The only way to dig yourself out of this hole, Mr Tempest, is to admit your mistake.